I never thought I would get hit with a culture shock my second weekend on Grounds, but when I went to my first predominantly Black party I was very wrong. Party culture and etiquette is something that should definitely be discussed more around Grounds, but it is a taboo topic for normal conversation. There are a lot of things that go unsaid, like what to wear, how to dance, and how to interact with other people. Code-switching is a must to make sense of all that is going on. Black parties act as a cultural epicenter for Black students at the University. It is prime time to socialize and meet other students having similar experiences. Parties foster a sense of community and a sense of belonging. 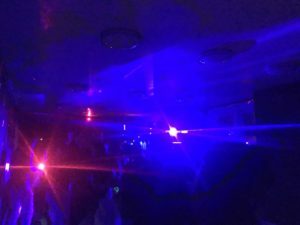 These parties have effective promotion, usually in the form of an online flyer, group chats, tabling at high traffic areas on grounds, and facebook events. Police presence on Grounds varies from night to night, and it seems like they really don’t care all too much about parties in general. So far in my two months at the University, two of the parties I have been to have been ended by the police. Both times were due to a noise complaint. Someone near the door yelled out “Feds” or “12” and most of the party’s attendees scattered like ants. When I went to predominantly white parties, I noticed they have a different dynamic. I pulled up to the door of pretty much any fraternity on Rugby Road dressed for whatever theme they had for the night. My friends and I said which one of the brothers we knew, they let us inside and we walked straight back to the beer that they have already begun rationing at 11PM on a Saturday night. Then we walked to the dance floor, but surprisingly we didn’t really dance. We just hung out for a bit with our red solo cups while scanning the room and trying to get a feel for the ambiance of the room. While both types of parties can be fun, I prefer Black parties. They offer me a sense of community and inclusion that I could not receive anywhere else. At predominantly white parties, I feel like there is a whole every-man-for-themselves mood which that makes me kind of uncomfortable. And trust me it never feels great to be uncomfortable in a crowded space. The important thing I remember is to stay safe by practicing smart habits, like staying with a buddy, and knowing helpful resources, like Safe Ride.